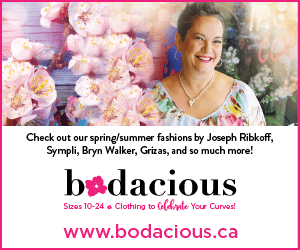 Inside a former industrial warehouse on the edge of Rock Bay is one of the city’s most remarkable inner sanctums of eclecticism, where high-end contemporary meets artful nostalgia. Welcome to Victoria’s ultra-creative side. A 14-foot-long island in a Monolith concrete composite with cupboards in a dark grey bamboo veneer is the centrepiece of this great room. In the background is a unique circular Heat & Glo Solaris fireplace. Its LED lighting and mirrored glass create the illusion of flames moving into infinity, viewable from both sides of the fireplace. PHOTO: JOSHUA LAWRENCE. 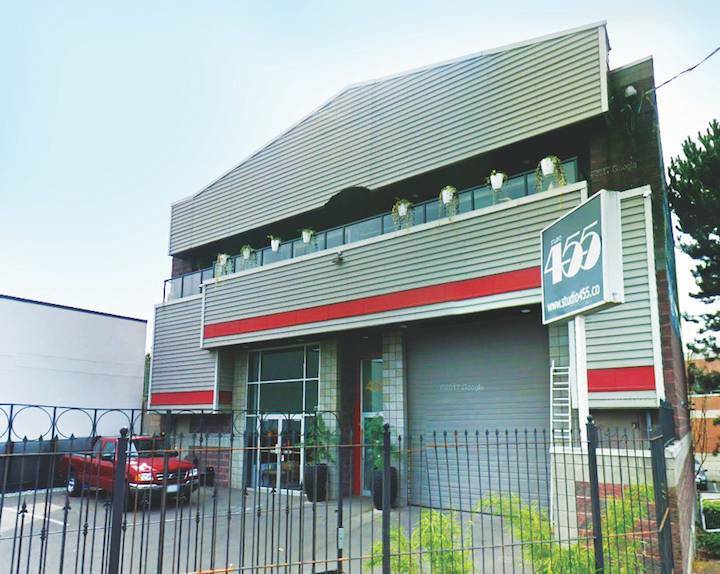 At first glance, the building at 455 Gorge Road East is a nondescript semi-industrial warehouse surrounded by a handful of parking spots and flanked by fast-food outlets and a corner store. There is seemingly nothing unique about it. But then there was nothing remarkable about the rabbit hole until Alice fell down it, and there was nothing unique about that train station until Harry Potter came along. But with this particular building, there were early hints something interesting was afoot inside. Had you glanced at the building after new owners purchased it in 2015, you may have spotted Monty, the gargoyle made of found objects and papier-mâché, on his commanding rooftop perch. And, if your timing was right, you might have seen a shiny vintage Silver Cloud Rolls Royce emerging from the garage. And you might have wondered about the wrought-iron gates framing a sign that simply said: Studio 455. In fact, this formerly run-down building on the edge of Victoria’s Rock Bay district hides one of Victoria’s most striking, inspiring renovations. Not only is it one of the city’s hippest places to hold everything from cocktail parties to live-music shows, it’s a vintage-car garage, art studio and the home of two people who made a conscious decision to live creatively. While the building is in an area zoned heavy industrial, the new owners were able to also make it work as a home because their living space is officially considered a caretaker suite. This four-storey-plus masterpiece is the creation of artist and architectural designer Charlotte Hale and retired military and commercial pilot Stephen Hale. The couple admits they spent a good deal of time exploring the city in search of a home that could satisfy Stephen’s need for a space for his vintage cars and Charlotte’s need for studio space for her design practice as well as for her paintings and sculptures. As if that wasn’t enough, Charlotte also wanted to create an event space for vibrant events, from discos to glam cocktail parties and speak-easy nights. “I wanted to shake things up, bring something new and provide a venue for creative expression,” she says. They looked at everything from houses to commercial buildings to undeveloped properties, but nothing seemed right until, in 2015, they set foot in the building on Gorge Road East. But it was not without challenges. “You would have needed X-ray vision [to see its potential], there was so much to remove from the building,” Stephen laughs. In fact, it took 77 Ford Ranger loads to the dump to clear out the building, which, in its most recent incarnation, held an auto-rack sales and installation company. Before that, it was home to a gambling circuit and an illegal satellite dish. There was a tremendous amount of work to do, including knocking down walls, building floors and removing scoop after scoop of raccoon feces. “But it was the most exciting space,” says Charlotte, and so the couple jumped right in, living on their boat for six months while they worked on the space every single day. Charlotte drew up floor plans and designs and the couple brought in VDA Architecture, the same firm that had designed the building more than two decades before. The reno was all consuming. The project became their baby. So committed were they to this space that they also held their wedding amidst the drywall, with warning tape everywhere. “It was like a New York City warehouse, but more dangerous,” Charlotte reflects. From the moment you enter the building, you are transported into the superlative. The front entrance is “all about tall and big,” says Charlotte. Stark white and stretching way up, the entry stairwell draws the eyes skyward, past Charlotte’s sculpture of a winged figure, to the light of the main living space. Guests may choose to climb the stairs or take the elevator Charlotte and Stephen installed for friends, for their future aging selves, and, of course, for carrying up groceries. 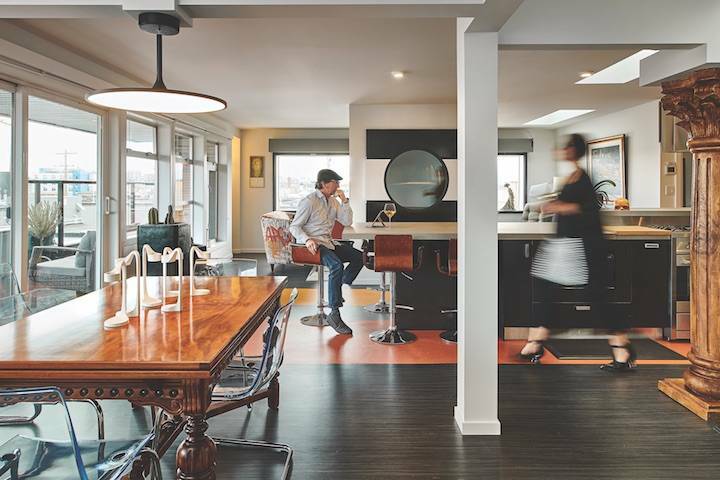 At 3,000 square feet, the area that makes up most of the couple’s private living space is an entrancing mixture of salvaged nostalgia and high-end contemporary. In the open-space kitchen and dining area, there’s a massive island with a skirtless hood “so we don’t block the view,” over the gas stove and stools for the inevitable kitchen parties. 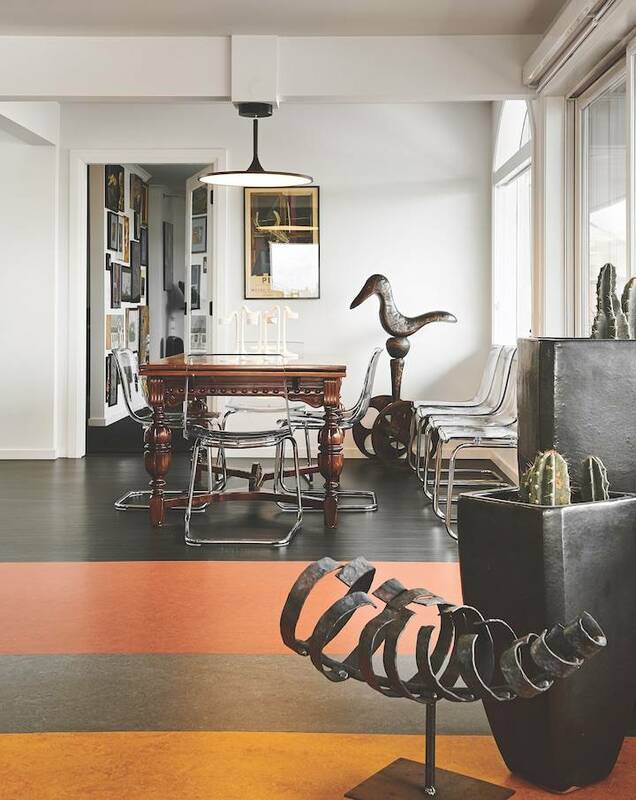 Thick stripes of copper, marigold and black marmoleum flooring (made from linseed and wood chips) unfurl along the floor and the colours carry on up the walls to draw and direct the eye. Beside the island, and separating the dining area from a living room, is a two-way Heat & Glo Solaris fireplace that gives the impression of depth through its mesmerizing use of LED lighting and mirrors. There are only a few of these in existence Canada-wide. On the other side of the island, a pair of large hand-carved wood Corinthian pillars from Thailand frame a rusted-out boiler that was wrestled off a beach on Thetis Island and repurposed as a table accessorized by a skull and an orchid. Charlotte says this table arrangement is “probably the most accurate depiction” of the meshing of both her and Stephen’s sensibilities. “Castle Hale” is a treasure trove of paintings, sculptures, posters, books and curios. It’s the eclectic expression of the dynamic couple who created it, and it’s full of things that shouldn’t go together but somehow do: an antique table pairs with Plexiglas chairs, and a circular LED modern art piece. And everything has been placed exactly where it should be. There is nothing haphazard, and nothing contrary to the couple’s nature. When Charlotte and Stephen took possession, there was very little light in the space and they had to put in a number of large windows, which revealed an astonishing and rare vista of the Olympics and of Victoria’s industrial district. Inlaid in the floor are exquisite pastoral tiles from Rome. Radiant heating extends into the shower with its two black showerheads that are somehow reminiscent of jet engines. Undercutting the taste and grandeur of the room is the Korean toilet in the water closet. It plays convivial music and offers different water options by way of a remote control for those nether regions. On the second floor is a cinema whose entrance is guarded by a wood and resin sarcophagus of Ankhesenamun, the great royal queen of King Tutankhamun, and a Herman Miller Egyptian cat, circa 1956. In this deep red, womblike theatre you’ll find old movie posters, like the one from Tank Girl, a popcorn maker, a subwoofer and old movie theatre seats along with modern media-room sofas that are cushy and heated. The carpet is seconds from a casino in the U.S. Mannequins populate the cinema, but they are also used as set pieces during event rentals. 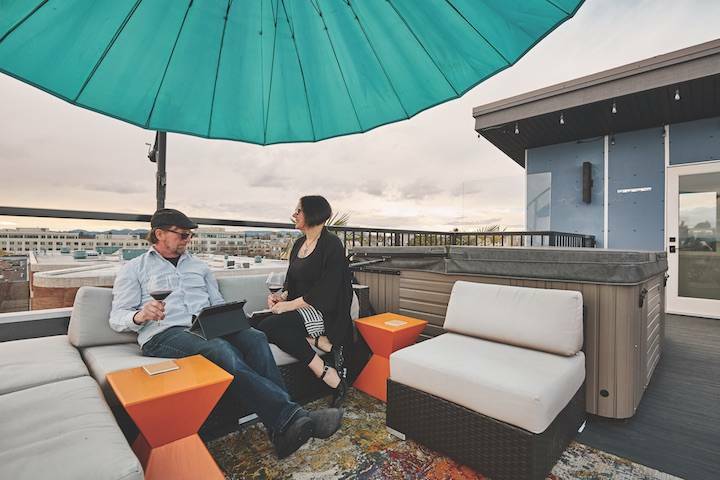 Climb up another level from the main three-bedroom living quarters and you’ll discover a rooftop patio with a rare view of the Gorge-Douglas area, its vistas extending all the way to the Olympics. A hot tub was a natural progression to enhance an impossibly gorgeous view. Downstairs from the living space is the big garage that is home to a collection of cars, including a vintage Jaguar, a new Jag, a vintage Norton motorcycle and Charlotte’s Karmann Ghia. There’s also a chauffeured 1960 Silver Cloud Rolls Royce, which Stephen rents as a stand-alone service or in tandem with event rentals. And then there’s the 2,500-square-foot Studio 455 event space itself on the main floor. While it may look much like an empty garage, it is in fact both Charlotte’s art studio and a blank slate that magically transforms for almost any occasion, from art receptions to DJ dance parties to burlesque entertainment nights to a cocktail enclave. The space is accessible, with 120 capacity, a full sound system and modular stages. And in the basement, just down the stairs from the event space, is a funky subterranean lounge, perfect for a breakout space or intimate gathering and workshops. Charlotte and Stephen confess that it took some time to adjust to the live/work nature of their home, especially the event business. Many couples wouldn’t subject their relationship to this level of chaos and financial and physical stress, outside of, say, having children. What was it that made this work? Did it work? Was it worth it? When asked the questions, Stephen, thoughtful, precise, conservative, looks straight ahead, like an arrow. Charlotte, radical, artsy, tilts her head up to the skies. “We are different enough but similar in the right areas to have a shared need to get things through to fruition,” she says. This consciously crafted “no compromise” philosophy also extends to finding just the right piece of furniture or art. 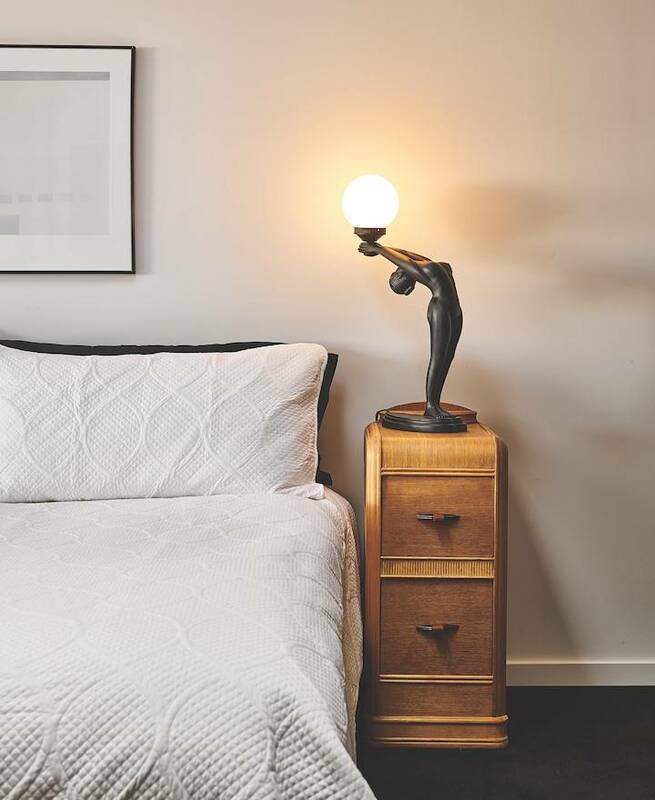 When two Art Deco lamps they had ordered from Texas on eBay arrived smashed into hundreds of pieces, Charlotte and Stephen spent months reassembling them, piece by piece. In search of the perfect TV-watching seats for the sitting area in the couple’s bedroom, Stephen came up with the idea of reclining car seats — and not just any seats would do. He procured two Mercedes Benz seats and wired them up to recline and heat up. “No compromises” may be time consuming, but it all pays off in the creature comforts and the tale to be told. And the big question for this creative couple is: Now what? With Studio 455 fully functioning as one of the city’s most amazing places to live and run a business, Charlotte and Stephen joke that their family is worried about what they will do without a big project. As for Stephen, “I will try to do nothing. Absolutely nothing,” he says with a smile. They keep busy responding to queries from potential customers who want to know about booking the event space or renting the chauffeured Rolls Royce — and responding to emails from the fan base of Monty the gargoyle, who sat up on the roof before suffering an injury in a windstorm, and is now awaiting repair. And, ultimately, what they have created is a work of art that is home. Outside the home, a nondescript semi-industrial warehouse surrounded by a handful of parking spots. PHOTO: JOSHUA LAWRENCE. 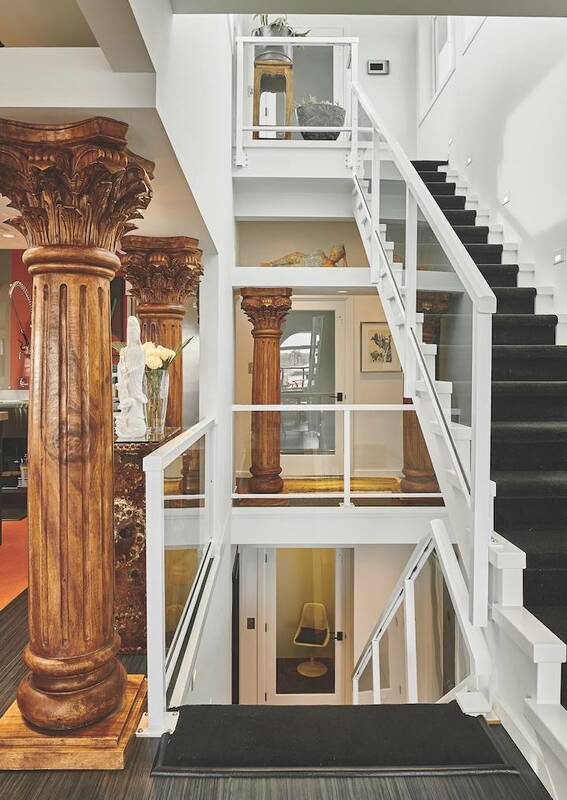 Stephen bought these decorative carved columns of solid rubber wood from Capital Iron years ago. They contrast with the graphic starkness of the stairway, with its white railing and black carpet, designed by Charlotte to suggest “a column of light.” PHOTO: JOSHUA LAWRENCE. Colour and ecclectism rule in this living space dominated by R.Ward’s oil painting Portofino and a carved Chinese daybed. 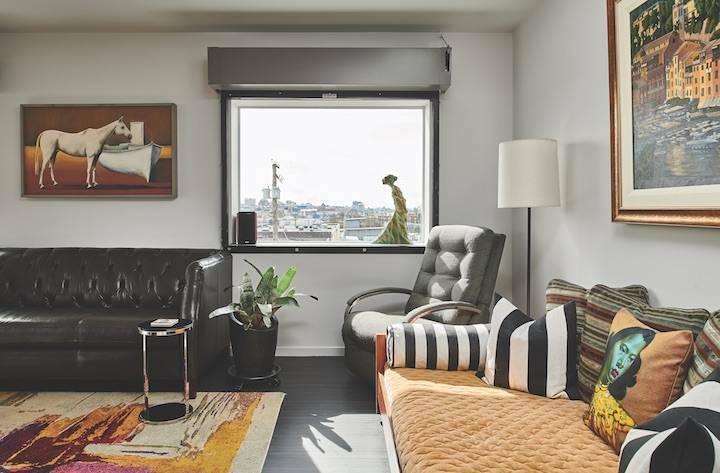 Above a vintage grey leather La-Z-Boy sofa is a painting by Canadian artist Susan Valyi. The Mid-Century Modern recliner in the corner is also vintage La-Z-Boy (Charlotte was a designer for the company.) PHOTO: JOSHUA LAWRENCE. 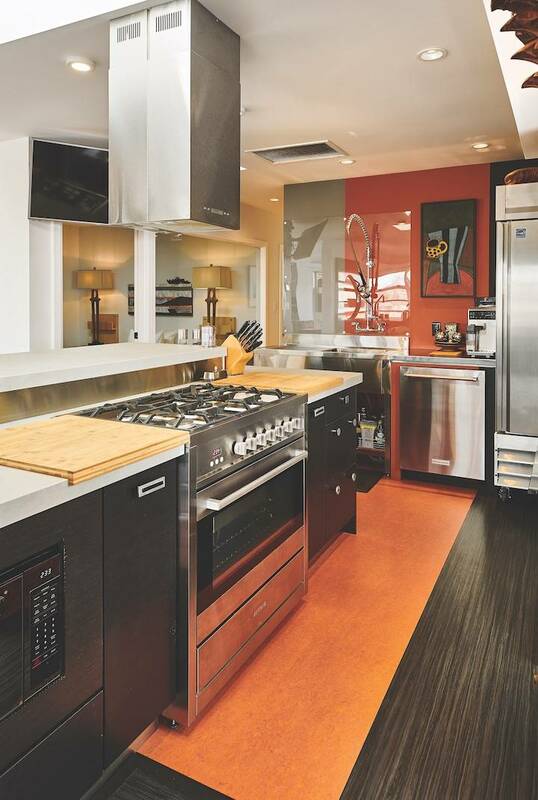 Charlotte wanted a semi-industrial look for the kitchen, from the janitorial faucet to the stainless-steel appliances and skirtless hood fan. The floor is eco-friendly Marmoleum in four colours, with the stripes echoing the striping of the plexiglass backsplash. PHOTO: JOSHUA LAWRENCE. A vintage mirror-grained walnut dining table is paired with plexiglass IKEA chairs to add seating without increasing visual clutter. In the foreground is Charlotte’s hand-forged and welded “Horn of Plenty” sculpture. In the corner is a bronze Peter MacElwan sculpture called “Roamin Duck.” PHOTO: JOSHUA LAWRENCE. 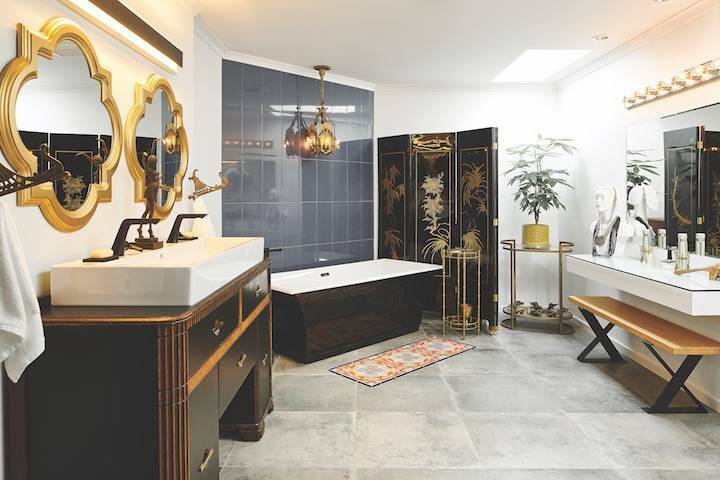 This Art Deco bathroom, inspired by its chinoiserie screen, features a vintage vanity-turned-washstand with a vessel sink and black fixtures. A free-standing tub with black fixtures is flanked by periwinkle porcelain tiles and a Beardsley Art Deco light fixture (Chicago, circa 1930). Colourful floor tiles from Italy create a faux bath mat. PHOTO: JOSHUA LAWRENCE. The master bedroom with its original Art Deco lamps that were broken into hundreds of pieces during shipping and had to be painstakingly reassembled by Charlotte and Stephen. PHOTO: JOSHUA LAWRENCE. 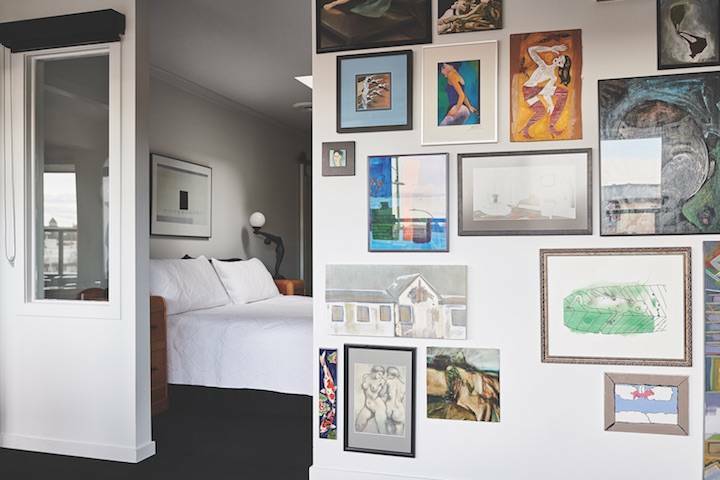 An eclectic art wall leads to the master bedroom. PHOTO JOSHUA LAWRENCE. Repurposed leather seats from a Mercedes contribute to the luxurious comfort of the master bedroom. 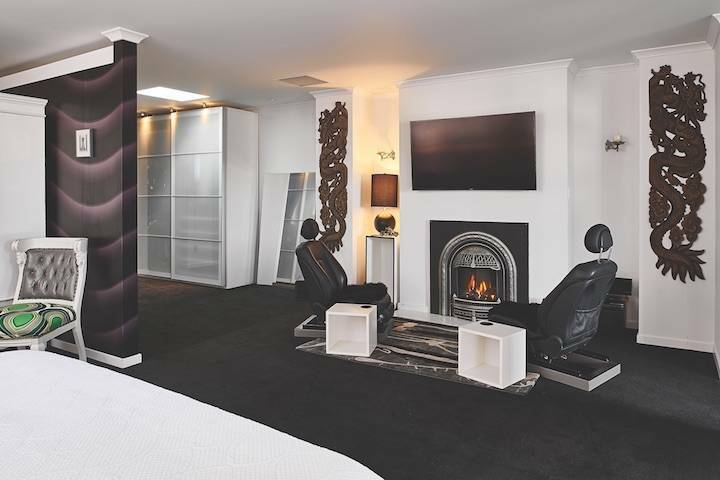 The Art Deco-esque fireplace surround, wooden carvings, along with black carpet and a feature wall in purples and maroons gives the room a plush sophistication. PHOTO: JOSHUA LAWRENCE. A spectacular rooftop view was what ultimately convinced Charlotte and Stephen to purchase their home. Creating the rooftop patio meant putting in 12 new roof trusses. PHOTO: JOSHUA LAWRENCE.